Issybella Lang is a student at the Hofstra University and an ISA Featured Blogger. She is currently studying abroad with ISA in Florence, Italy. I’m sitting outside of a small cafe beside the Duomo, sipping on a smoothie and sketching the people that pass by, enjoying the sounds of Milan Fashion Week. It’s like a shot straight out of a movie, but no movie is any good without conflict, and mine was about to arrive in the form of two men. They come rushing up to me, slamming a map down across my belongings and speaking rapidly in some language I don’t understand, and then they’re off in a flash. In the aftermath, I realize: my phone is gone. Here’s the thing: I’d read plenty of articles and blog posts before I left the U.S., and I knew that a large majority of students are pick-pocketed while studying abroad. I always assumed that if I were in that position I’d panic. I’ve had panic attacks before over crickets and calculus, and it didn’t seem too far-fetched that I would have the same reaction to being stranded in a foreign city, but luckily for me, I was wrong. Of course, I panicked a little; my train ticket home and the only contact with anyone I knew had just been stolen right out of my hands. However, I wasn’t rendered useless in my panic, and I was able to rationally come up with a new plan every time a wrench was thrown in my old one. It might have taken me seven hours to end up with a functioning phone and filed theft report, but with the help of the wonderful staff at my hostel and my own perseverance, I was able to not completely fall apart. I’m not thankful for the pickpockets, as my parents and I have had to spend around $600 between new phones and shipping costs, but I am grateful for what this experience has taught me about myself. I’ve always been viewed, both by myself and others, as a very anxious and panic-prone person, someone who is practically useless in high-pressure situations. I’ve always said in interviews that I work extremely well in organized situations, but that unexpected change can really throw me off. I and those around me believed that if I were pick-pocketed while traveling alone I would become incapacitated by panic, but we were all wrong. There is some commissioned graffiti on the walls surrounding the grounds my hostel is on, and the one right next to the entrance gate really stood out to me. 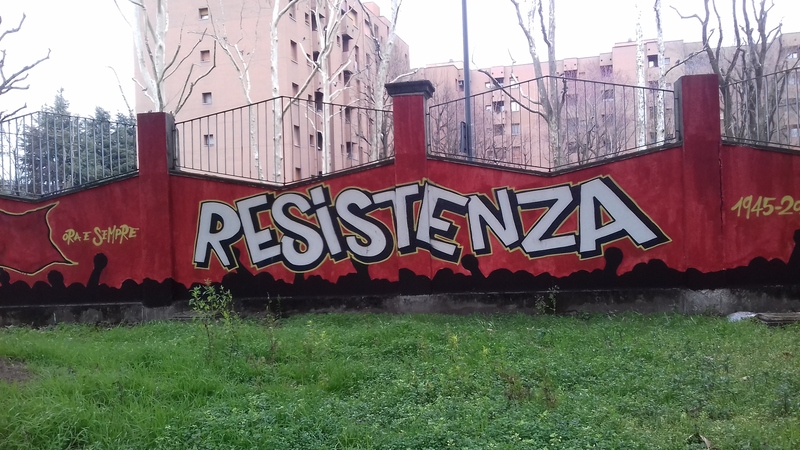 It says “resistenza” across a bright red background, and it’s referring to the historical anti-fascism resistance in Italy, but it came to symbolize my own resistance in Milan. There were several times that I wanted to just forget about the report and go to bed, and I’ve never wanted my mother more in my entire life, but I kept going. I resisted the easy way out and came out so much stronger than I ever believed I could, and I cannot wait to share the strength and rationality I discovered within myself with others when I return to the U.S.